Hitch jumping at Bell Hill Road Crossing on Adobe Creek (Clear Lake, CA). Photo by Richard Macedo, California Department of Fish and Game. California has a remarkable collection of native freshwater fishes, many of them found only in the state. To me, these native fishes define the unique regions of the California mosaic. 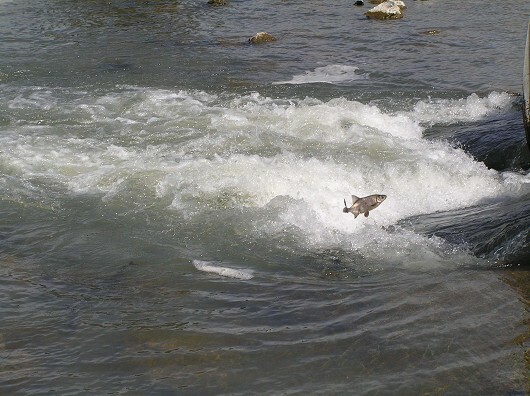 Southern steelhead persist in the face of extreme urbanization in southern California. Various pupfish species thrive in tiny, isolated desert springs. The eastern Sierra has cutthroat trout, mountain whitefish, Tahoe suckers, and tui chubs in cold streams and alkaline lakes. Tui chub, approximately 10 cm (4”) long, frontal view. Photo by Dave (Gio) Giordano. The arid northeastern corner has curious species such as the Modoc sucker, rough sculpin and redband trout. The Klamath basin supports an amazing diversity of salmon and steelhead, as does the North Coast. And, the crown jewel of inland fish diversity, the Central Valley, is the sole home of many species with varying degrees of fame, from Delta smelt and winter run Chinook salmon to tule perch, green sturgeon and hitch. But most of these fish are swimming toward extinction. Jacob Katz, Rebecca Quiñones and I just completed an analysis (Moyle et al. 2011) that indicates of the 129 freshwater fishes native to California: seven (five percent) are extinct; 33 (26 percent) are in danger of extinction in the near future; 33 (26 percent) are on a trajectory towards extinction; and 34 (26 percent) are declining species not in immediate danger of extinction. Finally, 22 (17 percent) species were found to be of low concern. Moreover, the pace of decline of native fishes is accelerating. Our analysis indicates that 83 percent of California’s freshwater fishes are extinct or at risk of becoming so, a 16 percent increase since 1995 and a 21 percent increase since 1989. Since our first analysis in 1989, about one fish per year has been formally listed as threatened or endangered under state and/or federal endangered species acts. But enough of numbers and statistics. Here are just five examples of the fish we are losing. Coho salmon—These fast silvery icons of the North Coast supported substantial sport and commercial fisheries in the years after World War II. Today they are on the verge of extinction in the state and symbolize the sorry condition of the rivers they need for spawning. Male coho showing its deep red spawning color. Photo by Thomas Weseloh, gallery of Northern California fish. 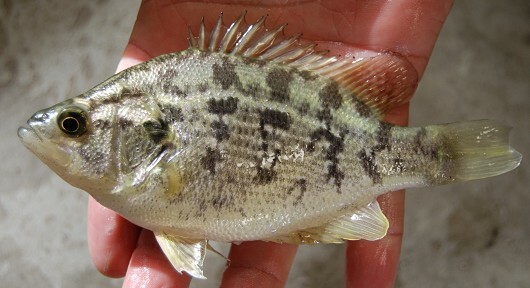 Sacramento perch—A lovely purple-sheened sunfish that grows to one to two pounds, the Sacramento perch is one of the tastiest of freshwater fishes. 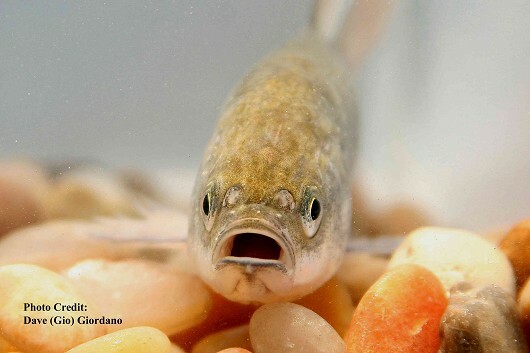 The Sacramento perch has already been extirpated from its native Central Valley rivers and survives only because it has been used to support fisheries in reservoirs elsewhere in the state and the west. But one by one even these populations are dying out. Sacramento perch, juvenile, Crowley Lake strain. Photo by Chris Miller. Pupfish—These one-inch fish were named for the apparent ‘playful’ behavior of the bright blue males in the clear springs they inhabit. There are 10 kinds of pupfish in California, although three are already extinct. They are remarkable for their presence in remote desert springs, including one species that inhabits the hot salty waters of Death Valley’s floor. They are threatened, as you might expect, by the high demand of humans for water in deserts. Most insidious is the pumping of the underground aquifers that feed the springs, to bring water to cities such as Las Vegas. 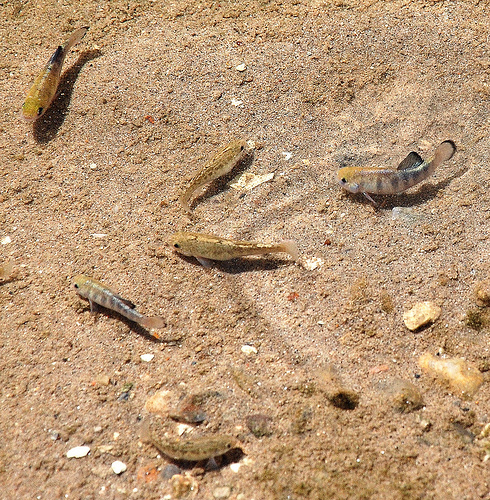 Salt Creek pupfish at Salt Creek, CA (Death Valley National Park). Photo by Dr. Cynthia S. Shroba, College of Southern Nevada. Southern California steelhead—Steelhead are perhaps the most remarkable sea-run fish among the astonishing diversity of such fishes that California supports. Their ability to adapt to changing conditions, including altering their life history traits/characteristics/patterns, is a classic example of biological resilience. Yet even these fish are having a hard time in the southern California streams that they once ascended by the thousands to the delight of anglers. Their streams are dammed, diverted, polluted, channelized and otherwise altered to make them unsuitable for fish (and people as well). 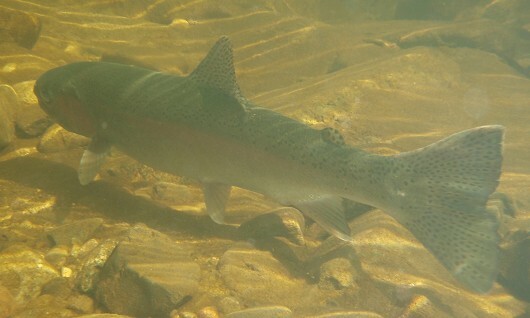 Steelhead in a Santa Monica Bay coastal stream. Photo by Steve Williams. Clear Lake hitch—Historically, every spring the streams flowing into Clear Lake have been dark with thousands of hitch migrating upstream to spawn, like small salmon. They have been an important part of the food webs of Clear Lake, eaten by predatory birds and fish. They were also once a major food of the Pomo people who live in the basin. Today hitch runs are greatly diminished, reflecting major changes in the lake ecosystem and in the landscape around the lake. Hitch spawning at Bell Hill Road Crossing on Adobe Creek (Clear Lake, CA). Photo by Richard Macedo, California Department of Fish and Game. 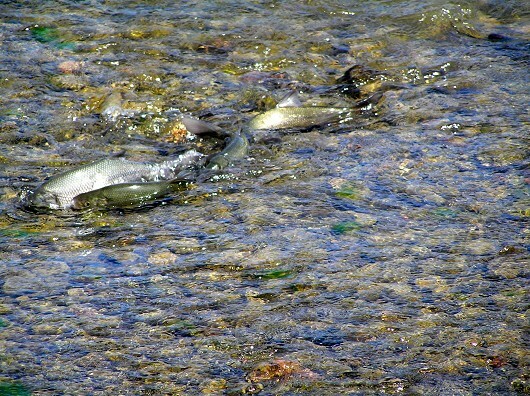 Ongoing efforts by state and federal agencies to restore natural spawning runs of Eagle Lake rainbow trout, an effort now being led by the Susanville Indian Rancheria. Restoration of flows to the San Joaquin River to bring back Chinook salmon and other native fishes to the once-dry river. Acquisition by the Yurok Tribe of the Blue Creek watershed, which supports examples of most of the salmon runs in the Klamath basin. Joint efforts of ranchers, agencies, and others to protect the endemic fishes of the Goose Lake basin, including Goose Lake redband trout, lamprey, tui chub and sucker. On-going work by The Nature Conservancy, UC Davis, and others to restore coldwater flows and salmon to the Shasta River (Jeffres et al. 2010). But these efforts are a fraction of what is needed to protect our natural waterways and the fish they contain. Such protection and restoration efforts should be an activity of government, given that the declines have diverse and long-term societal causes, and given that these abuses often affect water quality and quantity essential for a range of human uses. Alas, in the near future, government involvement seems bound to decrease as budgets get slashed. Therefore, more and more, it will be up to citizens and non-governmental organizations (NGOs) to protect our streams and fish. Our native fish make California special, like giant sequoias, sea otters and condors. Without them, our state is just another trashed Eden. Ultimately, we Californians will discover that keeping free-flowing water in good shape for fish is also good for us! Hanak, E., J. Lund, A. Dinar, B. Gray, R. Howitt, J. Mount, P. Moyle, and B. Thompson. 2011. Managing California’s Water. From Conflict to Reconciliation. PPIC, San Francisco. 482 pp. Jeffres, C.A., L.A. Nichols, A.D. Willis, J.F. Mount, P.B. Moyle and M.L. Deas. 2010. Assessment of Restoration Actions on Big Springs Creek, Shasta River, California 2009-2010. Report prepared for: The National Fish and Wildlife Foundation. Marchetti, M. P. and P. B. Moyle. 2010. Protecting life on Earth: an introduction to conservation science. Berkeley: University of California Press. 232 pp. Moyle, P. B. and J. E. Williams. 1990. Biodiversity loss in the temperate zone: decline of the native fish fauna of California (pdf). Conservation Biology 4(3):275-284. Moyle, P.B., J. V. E. Katz and R. M. Quiñones. 2011. Rapid decline of California’s native inland fishes: a status assessment (pdf). Biological Conservation 144: 2414-2423. This entry was posted in California Water, Conservation, Fish, Uncategorized and tagged California, ecosystem, fish conservation, Moyle, native fish species, salmon, UC Davis Center for Watershed Sciences, water conservation. Bookmark the permalink.